In this image, astronomers use the NASA/ESA Hubble Space Telescope and a cosmic zoom lens to uncover the farthest known galaxy in the Universe. The newly discovered galaxy, named MACS0647-JD, is very young and only a tiny fraction of the size of our Milky Way. The object is observed 420 million years after the Big Bang, when the Universe was 3 percent of its present age of 13.7 billion years. Astronomers used the powerful gravity from the massive galaxy cluster MACS J0647+7014 to magnify the light from the distant galaxy, an effect called gravitational lensing. The bright yellow galaxies near the center of the image are cluster members. Due to the gravitational lensing technique, astronomers observed three magnified images of MACS0647-JD with the Hubble telescope. 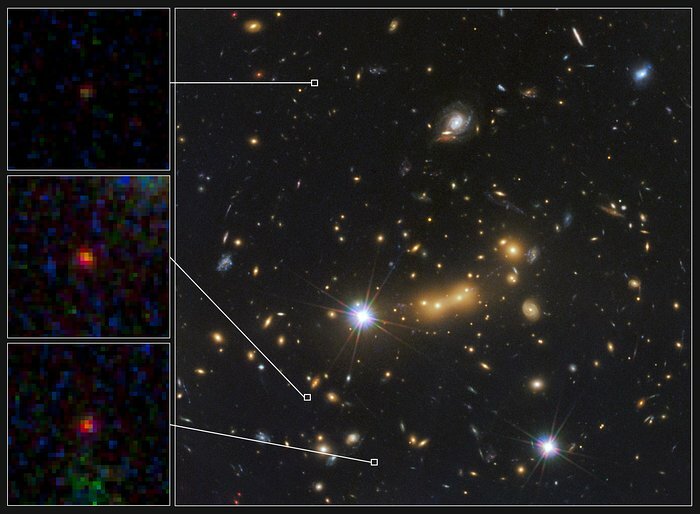 The cluster’s gravity boosted the light from the faraway galaxy, making the images appear approximately eight, seven, and two times brighter than they otherwise would, enabling astronomers to detect them more efficiently and with greater confidence. Without the cluster’s magnification powers, astronomers would not have seen this remote galaxy. The three close-up images of the magnified galaxy appear in the inset at left. This is the latest discovery from a large program, called the Cluster Lensing And Supernova survey with Hubble (CLASH), that uses natural zoom lenses to reveal distant galaxies in the early Universe. This image is a composite taken with Hubble’s Wide Field Camera 3 and the Advanced Camera for Surveys. The observations were taken 5 October and 29 November 2011.